This year is my son’s first year at preschool. We are off to an amazing start and having a great time! I can’t believe how well he has adjusted. When he gets home, he talks nonstop about his teachers. He tells me what games they play and what songs they sing. It is absolutely wonderful to see him flourish! 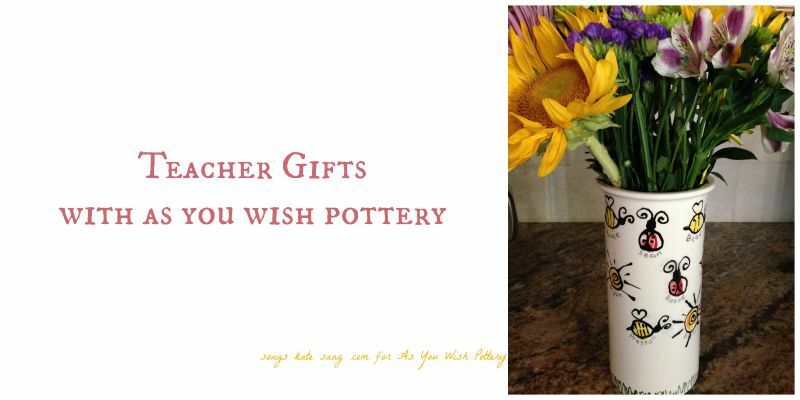 When the room mom emailed about his teacher’s birthday, she suggested that the kids make something personalized from As You Wish Pottery! This was a very special birthday, so we wanted to make a very special present! The room mom purchased the vase and paints and brought it to the school. Each kiddo chose a color and did a thumbprint on the vase. The thumbprints were labeled with their names and turned into adorable bees and ladybugs and butterflies! (They simply labeled each thumbprint using a #2 pencil). The room mom returned the vase to As You Wish Pottery to be glazed a fired, picked it up a few days later, and added some beautiful flowers. This made the most precious gift for their special teacher! I love being able to give a gift that will be used for years and that will bring a smile and a happy memory anytime it is used. Seeing the adorable four year old thumbprints and knowing that you were a part of their life must make for a very warm heart.